Flying between Europe and Australia I regularly gaze down at the Maldives and on one occasion, five years ago, I even blogged about identifying the islands I was flying over from 35,000 feet. 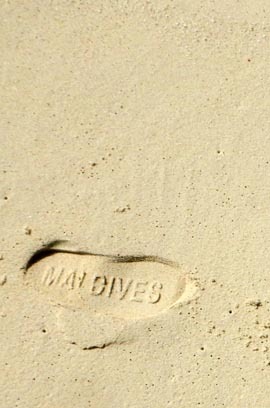 So it was time I paid a Maldives visit although I don’t think I’m going to be in a hurry to go back. If, despite my lack of enthusiasm, the islands really attract you check Tablet Hotels story on overwater bungalows in the Maldives. Tablet are my go to source for interesting hotels around the world although I didn’t use them on this occasion. ▲ I never went to Male, the capital city, although nobody seems very enthusiastic about the place. Most visitors only seem to stay there if it’s necessary for their flight connections. Recently a bridge has been built connecting Male the city with Male the airport and Hulhumale, the new reclaimed-land island the other side of the airport. This view looks over the runway towards the city with the bridge on the left side. 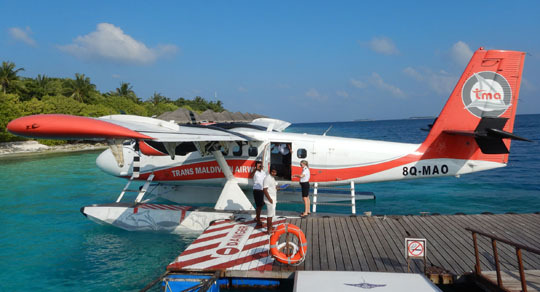 ▲ Transfer to some islands closer to Male are made by boat, but there’s a huge fleet of amphibious Twin Otter aircraft to ferry guests out to most of the islands. Trans-Maldivian Airlines alone has more than 50 of them. ▲ When you get there the beaches are as white sand as you could ask for and the water clear, blue and warm. ▲ And everything is pretty as a picture. 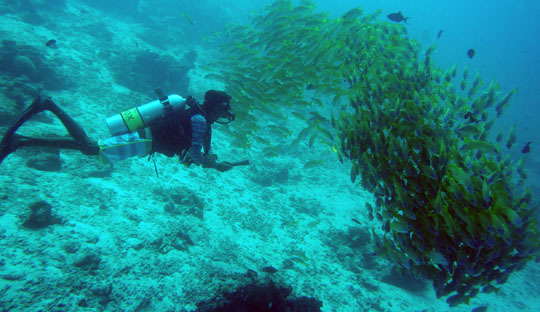 ▲Scuba diving is a big Maldives attraction, here’s the divemaster from my resort meeting up with a school of blue stripe yellow snapper. First time I’ve used my new Nikon Coolpix W300, which doesn’t look for a moment as if it could be used down to 30metres. It can. 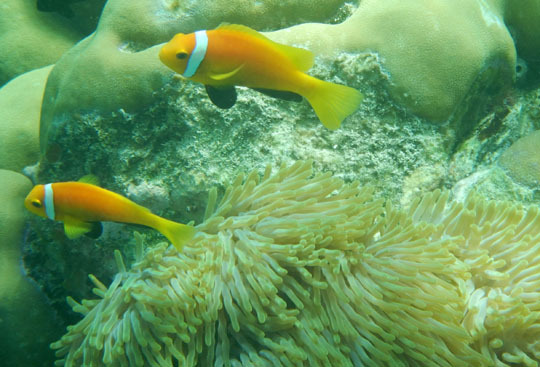 ▲ I always like to see clown anemone fish and although I saw plenty when I was out scuba diving this anemone was just a snorkel visit from my room. So why didn’t the Maldives grab me? • The resort I was at was simply too quiet. Peaceful and calm is one thing, this was more like fast asleep. Nobody seemed to do anything, not even scuba diving. • It was absurdly expensive, something which I think applies to pretty much all the Maldives resorts. That meant everything from a meal, to a glass of wine, a bottle of beer, a bottle of mineral water, spa treatment. And they push that expense – they do have local mineral water (US$5 or 6), but they’re always trying to flog you imported stuff (US$15). Do you need to come all the way to the Maldives to drink water brought from France or Italy? And I hate places that add a service charge and then give you a gratuity line on the bill. 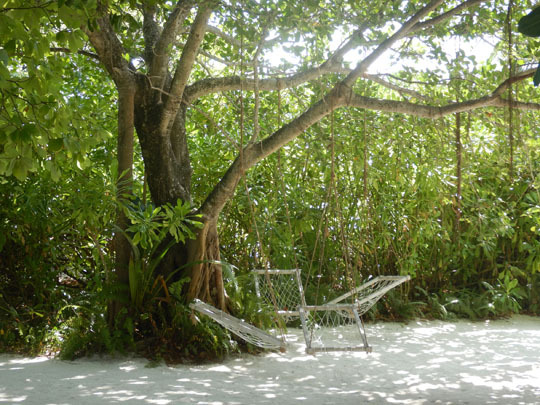 • Clearly some islands have a real go at eco-responsibility – there’s lots of sun so put the solar cells out. Unless they had it hidden away somewhere there was zilch at my resort and I think that’s the case at a lot of the resorts. • The diving was not bad, but not fantastic, although to be fair diving was one thing that wasn’t priced over the top. And since nobody else at the resort went diving the whole time I was there I had things to myself.